Buying a property (home/plot/land) is one of the most important decisions that you will ever make. Buying a property involves a lot of money and it is a serious money decision. It is an emotional one too! Whether you are a first-time property buyer or an experienced owner, buying a real estate property in India is not an easy task. It requires lot of homework from your side and you need to verify lot of property documents. One of the important documents that you need to apply and verify is an Encumbrance Certificate or popularly known as the EC. An encumbrance certificate is important not only while buying a property but also when you are applying for a home loan or going in for a loan against the property. In this post, let us understand – What is EC (Encumbrance Certificate)? What are the important points that you need to verify in an EC? What are the charges or fees to apply for EC? …. Let us first understand, what is ENCUMBRANCE? – The dictionary meaning of the word encumbrance is, ‘a claim on property or assets’ or ‘a mortgage’. An encumbrance is a legal claim on a property that affects the owner’s ability to transfer the ownership of the property. Encumbrance means whether the properties have any lien on them, whether attached by the court, whether mortgaged or sold etc. by the owner of the said properties. An encumbrance certificate is evidence that the property in question is free from any monetary and legal liabilities. An encumbrance certificate contains details of all transactions done on the specific property. For example – If the property in question has a home loan on it then you can find this information when you take EC. If the current owner has acquired the property through a Gift Deed, you can verify these details in EC. How to apply for EC? What are the charges/fees to get EC? What are Form 22, Form 15 & Form 16? How to get EC offline? To obtain EC, you need to submit Form No. 22 (application for EC). You have to affix Rs 2 non-judicial stamp on the application. You need to provide complete residential address and the purpose for which the certificate is required. Enclose copies of your ID proof and residential address proof. Submit the forms to the concerned officer at the SRO (Sub-Registrar Office). The fee can vary from State to State. Generally it is very nominal. The ‘search fee’ for 1st year can be in the range of Rs 15 to Rs 50 and for every additional year there can be fee in the range of Rs 5 to Rs 10 (approx). In some states like Andhra Pradesh, you can download the Encumbrance certificate free of cost online. But it is issued as a report for information purposes and not as a signed certificate. However, you can find all the required details even in online copy too. (Click here to visit AP Registration Dept’s website and search for e-Encumbrance Statement online). The time taken to get EC statement is around 10 to 30 days. Personally, I have observed that in most of the property deals, it is either the financial institution or a real estate agent or an agent at SRO who applies for an EC. Most of the times, the agents charge EXTRA amount to get the EC for you in 24 hours 🙂 . What are Form No. 15 & Form No.16? When you apply for EC, it is issued either as Form 15 or Form 16. 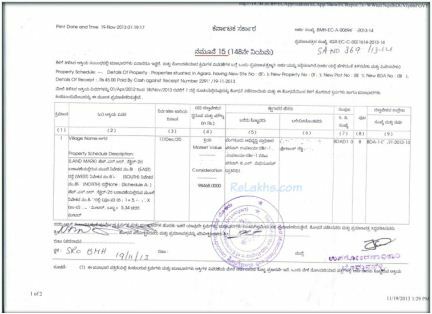 Below is a sample Form 15 issued to me by the SRO of Bommanahalli, Bengaluru, Karnataka. Kindly click on the image to enlarge it. Form No.16 – EC on Form 16 signifies that no transactions have been recorded on the property for the period for which the EC is issued. Form 16 is also referred to as ‘Nil Encumbrance Certificate’ (or) certificate of Nil Encumbrance. 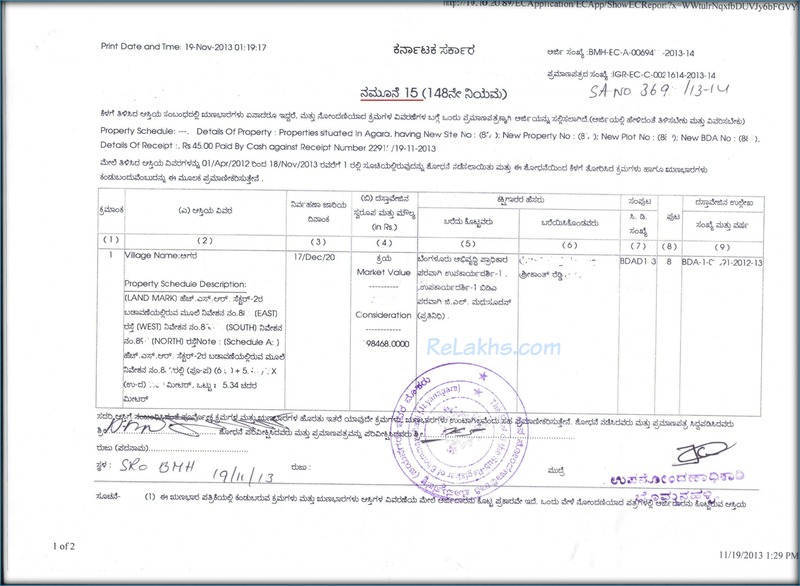 I have downloaded an online EC statement for one of my properties located in Andhra Pradesh. This property has been gifted to me by my Grandmother. Here, you can notice that the ‘Gift deed’ transaction details have been captured and recorded in EC. You can get to know who has applied for the EC statement. If you have applied for it, you will find your name here. The property details that you have provided in the Form 22 (EC application form) will be mentioned here. You can notice the number of years for which the EC has been sought. I have searched for the encumbrances for the last 33 years. EC will give you the complete property description as recorded in the Sale Deeds which are registered and recorded in the books of Sub-Registrar office. In 1984, my grandmother bought this plot. In 2007, she has executed Gift Deed in my name. Like wise, if you are buying a property which has home loan on it (home loan taken by current owner), you can find ‘mortgage’ details instead of ‘gift settlement’ in this column. Another example can be – let’s say if partners of a firm mutually purchased the property and one of the partner wants to release his share from the property then in that case, Release Deed can be executed and registered. In this case, you can find ‘Release Deed’ details in EC. You can find the name(s) of the buyer and the seller (E – Executor/Seller & C – Claimant/Receiver/Buyer). If the property is a jointly held one, you can find multiple owners. If there are multiple transactions done, all of them will be inter-linked in the Registration Dept’s database. For example- the first transaction has a Registered document number as 44/1984 and the same is linked to the second transaction (Gift settlement). So, if you see these kind of links in your EC, you can request for the copies of all Link Documents (including the Mother Deed) from your Seller/Builder. In this way, you can establish the continuity of parent documents with child documents. There is no doubt that EC is an important document. However, we need to be aware of the fact that only the transactions which are recorded in the books of Sub-Registrar office (SRO) get reflected in Encumbrance Certificate. If you take a home loan and your lender does not report the mortgage details to SRO, it won’t be captured in EC. Similarly, any family settlements which are not registered with SRO will not be reflected in EC. Besides, EC you may also ask for Possession certificate or Allotment letter from your seller. The EC is usually maintained in electronic form for the more recent period and it is usually quicker to obtain EC for the recent years. If the property has very few transactions, it is vital to get EC for much older period and this may involve periods which have manual EC (non-electronic EC). Sometimes, the entries in EC might have typo errors / clerical errors. You can inform about these to your prospective Seller and get them corrected before buying the property. Do note that EC is a mandatory document when applying for a home loan. Advisable to take EC not only when buying a property but also after buying the property, to check if your name has been recorded or not. Take EC even before booking your Flat or apartment and not after booking the Flat. Property purchase can be a very lengthy, risky and complex process. It is wise to consult a local civil lawyer and take legal opinion before registering a property. How to get Property Encumbrance Certificate online in Karnataka? What is Mutation of Property? How to apply for Mutation of Property? Is this an Agricultural land? Hi Sir, . (MR) and . (ME) ..could you please suggest what they mean..! I believe that ME & MR stands for Mortgage (loan) Executor and Mortgage Receiver. Need your help in evaluating the plot genuineness. I have the EC of the plot & i saw the below Mortgage details. What exactly is this mean & also if the party has done the Mortgage then the reverse registration is also required ? But in 2018 someone purchased it & registered on their name. Yes, there should be a Release Deed. A deed of release is a legal document that releases parties in a deal from previous obligations. It is most commonly used to transfer the title of a real estate property to the homebuyer once the mortgage has been paid in full. But i didn’t see the release deed. They have NOC from the bank. Also, after this they recently sold & did the registration. Now selling to us. Kindly get the documents checked with a trusted civil lawyer..
1.my grand father have a land in 1930 of Servey no 439-2. 2.we forgot the registration documents. 3.after no registrations done on that property. 5.we have land tax documents of that property receipts . We don’t know the registration details of that property. How to get the registration document details. Suggest you to visit the concerned Sub Registrar office and inquire more details on this property. Sir, I am trying to purchase plot in Hyderabad. But survey number Showing.96/A/4. Some my friend suggested me to don’t buy, plot has some litigation. Kindly suggest me what to do. Dear Ravi ..Suggest you to kindly consult a local civil lawyer..
1. My grand father has land. 3. He sell 4.Ac in 1983. register documents are clear but in Ec it showing error like total 8.31Ac property showing who have buy in 1983 we have. How to clear those error can you kindly guide. Dear Navi.. I do not have the required information! Want to know the difference between manual EC and online EC . Which one is valid . If i register a property based on sub register EC which is currently provided online. ..later if some one claims that it is my land whose name was not listed in the sun registrar EC .. will be any problem to me . I have already taken loan from lic for buying this property. My dad is very much tensed as this is the first property we bought. Kindly advise. Now a days, online EC is issued for most of the properties. But, if you want an EC for the last say 30 years for a property then EC can be issued offline. Kindly note your Lender would have also done due diligence before sanctioning the loan to you..so kindly dont get worried! Very nice and informative article. Thanks for sharing very useful information. Hi Sir, I am planning to close my home loan with HDFC. my flat is located in Hyderabad, i see no mortgage or lien info on the EC. Do i need to do any thing in SRO office after the closure of my loan or just taking no due certificate from bank is sufficient. Please suggest me. If your home loan is still in active/open status, ideally you should see a ‘mortage lien’ in the name of your Banker. Kindly take latest EC again after closing the home loan, just to make sure everything is fine. Yes, kindly do take No dues certificate from your banker and collect all the original Documents from them. My grand father had 15 acres of land. during his young age his father expired and he had to come with his mother to another village and that property went unattended. And other villagers are using it. Can my grand father claim it now? Do you have any valid documents to prove the ownership title? Is this Agri land? Do you have patta in your Grand father’s name or in his father’s name? we are having a plot.when we took EC of it and it is showing E beside executant name and the claimant name.like (E)rama and (E) sita there is no CL written on it.Is there any problem.can you suggest us. Probably, the staff at Sub-Registrar office might have done some clerical error. Let’s not risk or assume, advisable to contact the concerned SRO and check if all is ok.
How do i download Encumbrance certificate in online using ECNUMBER ot Transaction Number. It depends on the availability of such facility in respective/concerned State Registration Dept’s portal. How can we get EC for old survey nos. i.e., say that the land is handed over in 1956. When trying to access in online EC of AP, it is not showing our survey Nos. and instead showing the other survey nos. Please help..
Dear Pavan..You may have to visit the concerned Sub-Registrar office and apply for manual EC. In mortgage showing only mrkt value, cons value showing as zero. What does that mean. Can you please explain. Cons. Value can be Consideration Value. For ex : The consideration value can be NIL but stamp duty (fees) has to be paid in Market value/Guidance Value. I have submitted the EC to bank dated 30.5.2018; For MODT, since 15 days have gone, Bank urges for fresh EC; Again need to wait for 7 days from Registrar; What is my fault in this? Dear hari ..You need to check with your Banker on this! I bought one of the plots from a layout with survey no 46 and part of survey no 48 in Hyderabad. We heard that few of the surrounding properties are under court disputes. How can I get information if my property is under any court issues or not (through EC or anything else)? The best source would be to visit the concerned Sub-Registrar office and find out from the staff. Ay and PL in EC means? Hi..I am not sure on this.. But, I have noticed these initials in EC against Mortgage Deeds of a property. My father,Mother have passed away in the recent past,and I have a sister.I have registered sale deed of plot of land which my father owned.My sister has given me no claim letter quoting the land details on a plain sheet of paper.I have obtained a surviving member certificate from the Tahashildar office which establishes we as legal heir .How do I proceed to transfer the property in my name. Advisable to get Relinquishment Deed from your Sister to avoid any future litigation. You can visit the concerned Panchayat/Municipality/Corporation office (Revenue dept) and submit copies of parents’ death certificates, latest EC, copy of Sale deed, legal heir certificate etc., at the civic office and can get your name registered in Govt revenue records. Kindly read : What is Mutation of Property? How to apply for Mutation of Property? It can be DR – Deed Receiver & DE – Deed executor..
Based on my personal experience, if one goes through an agent, can get EC the very same day (but have to pay EXTRA fee). Else, can get the EC within 3 to 7 days. We purchased a flat in an E Auction from PNB chennai, by the year 2015 at ayanavaram. Now we decided to sell. When we purchase, the property had civil court attachment, borrower availed cash loan from a financier, its a money suit. The bank mortgage is prior to the Civil court attachment. During registration, the sub registrar informed us, the attachment shall be removed or to get a court order. We approached the bank and bank filed mandamus writ petition at HC and got the court judgement, to get the register the property in our name. We got registered by 2016, and rented the property. Until now no notice from the unsecured creditor. But the attachment still reflects in EC, not removed. 1. Whether our property free from all encumbrance. Our advocate Mr. M.L. Ganesh (Bank Advocate) informed before and now, no issue on the property title. Since the lender is an unsecured creditor. There were four properties from the same borrower, the unsecured creditor attached to all four properties dividing the total amount. 2. If we are selling whether the purchaser can go for a bank loan. This also confirmed by Mr. MLG possible. 3. whether we can register the property since the attachment still prevails. Now a party is ready to purchase the flat, he may go to apply for bank loan. We don’t want any problem to the purchaser and the real estate agent. Is the latest EC reflects your name as the current Title owner of the property? If so, your lawyer can be correct. If the prospective buyer is going for a loan then his/her Lender/Banker will also do the due-diligence (especially on the Title of the property). So, you can get to know about the issues (if any) during that time as well (from buyer’s banker). Related article : How to save Capital Gains Tax on Sale of Land / House Property? Hoe to remove an entry on EC? I rented my flat to a bank in 2011, and the lease agreement was registered in the registrar office. Now I want to sell the flat, the buyer obtained an EC and it shows an entry that I owe that bank an amount of 3Lacs (which seems to add up to Rs.25,000 rent for 12 months) though the security deposit was 2Lacs. When they vacated the flat in 2014, I returned the security deposit. How to remove this entry on EC? I am told I should get a discharge deed from the bank. What do I do once I get this discharge deed? As the ‘Lease agreement’ was registered in Sub-Registrar office, you now need to get ‘Discharge deed’ executed and registered, so that your property can become a free-hold one again. After executing this deed, you can take EC again..
MR and ME in EC stands for? I believe that ME & MR stands for Mortgage Executor and Mortgage Receiver. Dear Lakshmi ..You may for rectification of Deed, for this all the parties (sellers) have to again visit the Sub registrar office and all of them have to sign the rectification deed. This is srikanth from AP, recently 2 months back i have purchased the land of 2.10 acres, as per audngal 2 acres on one survey number and 10 cents on another survey number. in the place 2 acres survey number he has put the 10 cents survey number and in the place of 10 cents survey number he has put the 2 acres survey number. we have not observed this mistake and completed the registration. when i went to apply pass book VRA/VRO they asked me to do modifications as per audangal in registration document. i went register office for modifications, registerer told seller people also should be present for modifications because they have to sign again on modification registration document. but seller people are not ready to come to sign on modification documents. in this case what need to be done, can you please guide me or give suggestion to me. Yes, the seller has to come & sign the RECTIFICATION DEED. Can this be a pre-planned work? One option can be – File a Declaration suit at your local civil court court will give direction to the subregistrar to rectify the document or court will give you declaration order. We have evidences for land like Registration copy(original) of Rs.100/-. In Registration copy sellers clearly mention my grand father name, that they r selling land to my grand father for RS.2000/- in 1985. But the land is using by sellers at present. Meanwhile my grandfather expired. So we have applied for pavathi kathe to my father name in Taluk office in Chickballapur district, Karnataka. But sellers had put petition (Takararu) case in Taluk office. So in order to get our land back what documents we should have? At present we have only Registration copy( original). Apart from registration copy what documents we should have. If your Sale deed has your Grand father’s name, then kindly do not worry, they may be just trying to scare you. You may go ahead with mutation transfer on to your father’s name and reply to their legal petition through a civil lawyer. When I Check the EC Of the property the person C name is reflecting in EC for the sale agreement he made with person A.
Kindly advice me. in future any legal issue will arise due to this DEC2011 Sale agreement made between person A and C . is it possible to remove the person C details from EC as it creates the litigation. The thing is both the persons A and C is not traceable. As he defaulted loan payments in 2011, I dont think he can enter into an agreement with other party without informing the banker. Also, the time-period (9 months) was over long back.. So, the banker’s view is correct. Suggest you to take advice from a civil lawyer as well. I am MR C and planning to buy the auction property. and it was owned by Mr A . Mr A has taken Home Loan in Bank X and default to pay the bank. now the bank is auctioning the property of mr A. When I took as EC on the property . it shows MR A purchased flat from MR.Y and got registered in his name and then on bank name in 2010 for market price 13l and consideration price 16L. and the EC shows this details correct and in addition in 2011 it reflects the MR A and MR B names with market price 0.00 and consideration price as 17l. Dear sudharsan ..Who is Mr B here? Hi, I have bought a property in Bangalore and I have an EC as well. As per the EC, the site was registered in some one else’s name before it was registered in our name, which we did not notice. We have been paying the property tax and all those documents are in our name. When we contacted the developer to get the previous registration cancelled, he said he has lost the original deed of the previous registration. What is the process to get the previous registration cancelled? That means you are missing a Link deed. If you the developer has sold a property to MR X, then Mr X has to sell the same to you. Based on the information give by you, the developer has sold the property twice to two parties. Kindly consult a civil lawyer and take advice. Bankers generally ask for all these documents..
Could you please explain us what does the RR ,RE and DR and DE stands for ? R, E & P stand for Registration Date, Executed on, Presented on respectively. DR – Deed Receiver& DE – Deed executor..
RR, RE what does it stand for.? I was checking EC. There I found these terms in Column (Name of parties (EX & CL)). It has a party name(RE) and a Bank Name(RR). Please explain ? I am not very sure about the exact full forms of RR / RE. Can you help me on one issue. My father constructed house in land which is given by my father’s grand father. May be document year is 1927. We lost the original documents. Kindly approach the concerned Sub-Registrar office. Read: Lost your Property Documents? How to apply for Certified Copy of lost Sale Deed? Your post is very informative and helpful. I am purchasing a plot of 310 sq.yards at kapullapada, vizag in a gated community venture. In view of this I approached e-seva for applying EC. They are saying that with only survey number it cannot be assured of getting the details of our plot. How do I approach in this case. Please suggest, thank you. You may try getting EC details online. You may also visit Sub-registrar office and get the details. How can i be able to get Encumberence certificate for Village, Vadsar; Ta: Kalol, Dist: Gandhinagar located in gujarat state. I approach revnue office, no one is aware of that kind of certificate so i approach district office, they deny from that kind of certificate exist for my inherited agriculture land. Please guide me where should i approach. Kindly try at nearest Sub-registrar office. You may ask for Khata extract or Patta extract at Revenue office to know the ownership details. Presently, Flat is on my name, I am having sale deed and possession everything fine. Now my flat buyer and his bank asking for registered Cancellation of this Sale Agreement done by Mr.B to Mr.A in 2013. As per my Buyer’s Lawyer, This is the case like one property sold to two person? Is is like that? Please help, I don’t know what to do. Builder (Both Mr.A & B) denied to do anything and not cooperating any way. Ever, not hearing and difficult to contact them since they are big builders. In the first para, you have mentioned that you have bought the Flat from Mr A and in the 6th para, you have mentioned that you have bought it from Mr B???? Is it only Sale Agreement, am I right? Kindly search for EC on the entire property and try to find out on whose name the land is? You may also take help of a lawyer from your side and take legal advice on this matter.